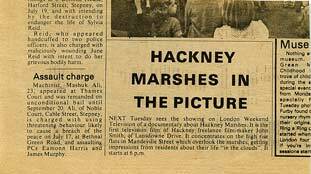 Next Tuesday sees the showing on London Weekend Television of a documentary about Hackney Marshes. It is the first television film of Hackney freelance film-maker John Smith, of Lansdowne Drive. It concentrates on the high rise flats in Mandeville Street which overlook the marshes, getting impressions from residents about their life "in the clouds". It starts at 6p.m. Every effort has been made to trace the original copyright holders, but if any has been inadvertently overlooked Luxonline will be pleased to make the necessary arrangements at the first opportunity.